Barns just don’t burn by themselves. Hay is flammable and the dust from hay and grain dust can be explosive. Maybe there are chemicals stored inside, but they should probably be in a drive shed or some other place if they are flammable or explosive. Sometimes the temperatures from something rotting can create a fire. Sometimes there is an open flame. Maybe an electrical wire is frayed. But there is always a reason, not some supernatural force that causes a barn fire to start. I feel safe in asserting that. On May 6, 1972, a barn in Sainte-Anne-de-la-Rochelle, Quebec burned. The source of the fire was members of the RCMP Security Service and they did it after a judge turned down a wiretap request. The Mounties argued that they believed that the Black Panthers were going to meet with Quebec separatists at the barn, which was owned by the mother of Paul Rose, who, at the time was believed to have killed Pierre Laporte. That was part of the October Crisis and Rose was considered a terrorist at the time and still is by many. The October Crisis was a dark time in Canadian and Quebec history. Outside of wartime, it was the first and only time martial law was declared in Canada. So, a meeting between actual or alleged Canadian terrorists and American terrorists seemed like a bad thing to have happen. The judge who denied the wiretap must not have been convinced that the evidence given to him required this level of surveillance. The Mounties, disregarding the judge’s refusal, escalated and burned down the barn. No meeting was actually going to take place and the Government of Canada admitted in 1977 that the Mounties had acted, um, extrajudicially. In the parlance of 2015, they were attempting to disrupt terrorism. Similarly, in 1973, the Mounties sought to disrupt a legitimate political party by breaking into the offices of the Parti Quebecois and stealing their membership lists. Many Canadians would have approved of that action at the time. Many still would. The notion of separatists angers many people in this country. But if a police force of a democratic nation can feel safe burning property and breaking/entering, what other criminal code violations will they ignore in the name of disruption? What violation is too great to give them pause? The Canadian government, under intense pressure, set up a Royal Commission in 1977 to report on illegal activities in the RCMP. 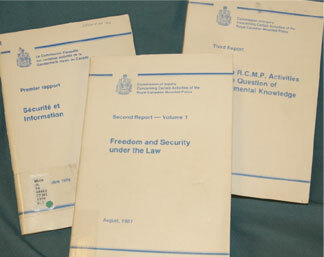 With the release of the McDonald Commission‘s final report in 1981, the government of the day acted on splitting off some of the Security Service’s roles to the new Canadian Security Intelligence Service (CSIS) and ensuring civilian oversight of security operations. Along with the Charter of Rights and Freedoms and the McDonald Commission’s work, abuses like the planting of moles in labour unions, dirty tricks campaigns against professors and students, opening mail, whispering that people were homosexuals or communists were going to become a thing of the past. To Americans, this kind of oversight was old hat for you. The National Security Act setting up the CIA, congressional intelligence committees and the Church Committee were behind you. Yet, Americans had the FBI and, specifically, J. Edgar Hoover. The CIA had its role to protect America from external threats. The FBI was a law enforcement agency designed to protect Americans from within. 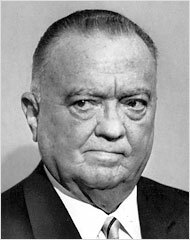 J. Edgar Hoover, keeper of secret files on Americans, noted civil liberties disruptor. The abuses of Hoover have long been on display. The taping of Martin Luther King, Jr. and the leaking of personal information, both true or fabricated, to secure political influence and destroy lives, are some that come to mind for many of us. The massive files, again containing both true and fabricated information, detailed groups or individuals under surveillance including some not very likely threats to the United States, like women’s rights advocates and Albert Einstein. A lot of this was learned through the Church Committee hearings. Some was revealed when a group of people broke into an FBI office in Media, Pennsylvania in 1971. The program that led to a lot of this spying on Americans, infiltrating groups, breaking into homes and offices without warrants came under the CoIntelPro program. There were precursor programs to this one and others that followed after, but in all of them Hoover was able to develop a system that in some cases created actual threats to American security. There is a terrific book, Subversives, by Seth Rosenfeld that details efforts to undermine Mario Silva and student protests at Berkeley in some measure by propaganda and partly by employing an agent provocateur who encouraged protesters to use violence. Today, we call it disruption. And in Canada, in 2015, the federal government has decided we need more disruption. The terrorist threats posed to Canada are so great, the government says, that we need to give CSIS the same kind of leeway that the RCMP Security Service had in the old days. This is the same kind of disruption that Hoover unleashed on Americans, while catching very few domestic terrorists, spies, or actual Communist threats. He did, however, ruin a lot of lives. It was enough for an agent to say they were looking for information on people that led many to lose jobs, lose homes and lose families or friends. Bill C-51 is the Canadain government’s instrument of institutionalizing disruption. It legitimatizes and normalizes activities that were decried in 1981. It calls for a whole lot of other things, but disruption is deeply, deeply troubling to me. Security and intelligence services have used disruption with propaganda, innuendo, false stories and planted agents. Sometimes they work and often they don’t. Not every act of disruption ends in barn burnings. One act of disruption, however, that had horrible consequences was the Protocols of the Elders of Zion. Often quoted by Nazis, anti-semites and anti-government types around the world, it was developed and disseminated by agents provocateurs acting on behalf of the Okhrana, the Imperial Russian secret police. The aim was to initiate and support pogroms in Russia. Not every example of disruption is over 100 years old and leads to genocide. In 1998, the RCMP in cooperation with an oil company blew up some of that oil company’s assets. This act led to charges against Wiebo Ludwig who was convicted of vandalizing energy company property. Ludwig’s guilt was judged, yet a major reason for the charges was the police bombing. Oil facilities, like barns, don’t just burn by themselves. Security services keep a lot of bad things from happening. The work is tough and they need all the tools they can get that both keep us safe and protect our civil rights. When the civil security agencies break the law–and governments allow them to–we lose trust and believe that they are not only out to get the bad guys. Many Canadians can point to abuses in the States or Eastern Europe of the security forces being employed for political ends. Law breaking is something, we think, that happens outside our borders. Yet, it happened here for a long time before Canadians became aware and uncomfortable with government-permitted disruption that broke the criminal code and ignored the judiciary. Not 20 years after the government and the RCMP were hauled on the carpet, the RCMP had graduated from burning barns to blowing up oil facilities. Bill C-51 will enshrine such acts and far more under the name of disruption. That will occur without increased civilian oversight and will occur in secret with judges. What happens when a judge says no to CSIS or the RCMP in 2015? It may be decades before we know what crimes were committed with government approval all in the name of disruption. One thing is for sure, no government will give up the ability to use disruption willingly and not until a lot of innocent people have realized why their lives were destroyed. Disclosure: I did not receive any cash or product from any terrorist organization to write this about bill C-51. I am simply ashamed that Canadians are contemplating that our freedoms are so easy to give up.